The impact of a strong Baylor-Waco partnership has never been more apparent than on the night of Sept. 15, when a crowd of more than 44,000 joined in Community Day at Floyd Casey Stadium and the ceremonial groundbreaking for the new Baylor Stadium. 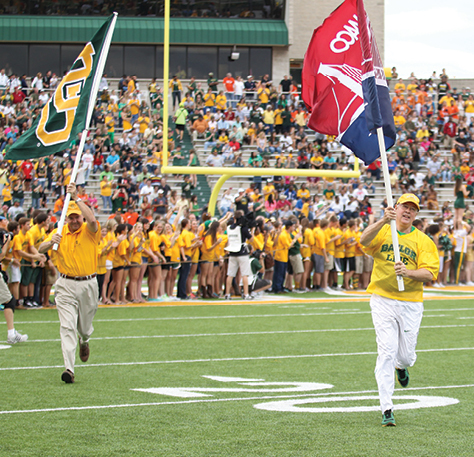 Waco Mayor Malcolm Duncan Jr. and Baylor President Ken Starr led the Baylor Bears onto the field as the game began and were joined by other city and university leaders for a halftime groundbreaking event. Baylor Stadium will be the largest single construction project in Waco history and a catalyst for economic development along the Brazos River and throughout the city. The ceremonial groundbreaking recognized the important partnership between Baylor and Waco, honored the city's TIF grant of $35 million for infrastructure development, and recognized the generosity of the remarkable donors whose gifts have put Baylor on the path to a new on-campus stadium. Drayton McLane and his family and Clifton Robinson and his family represented the extraordinary alumni donors at the ceremony.